Money concerns can definitely present challenges to getting OCD treatment. If financial difficulties are keeping someone you’re counseling from getting help to overcome OCD, it’s important to inform him or her that there may be ways to reduce or finance the costs of treatment. Here are some ideas for how to pay for treatment or stretch limited dollars to get help. If the individual with OCD is of an age that qualifies him or her as a dependent under a parent’s health insurance policy, you can suggest that the parent contact his or her insurance carrier to discuss coverage. Which services are covered in the health plan? Is there a list of preferred therapists for Cognitive Behavior Therapy (CBT)? Does the policy have annual or lifetime limits for mental health services? If the individual with OCD is a college student, the student health center or counseling center at the college or university he or she attends should be contacted. Many colleges offer student health insurance, which may include coverage for mental health services at deeply-discounted rates, or free of charge. Some colleges and universities have on-staff psychologists who are trained to offer Cognitive Behavior Therapy. Campus services may also be able to make referrals to psychologists in private practice who are trained and experienced in providing Cognitive Behavior Therapy. If the individual with OCD is a military veteran, mental health services may be available through some veterans’ hospitals. Disability benefits may also be available through Social Security for those who qualify. In addition, certain individuals with low incomes who cannot afford to pay for medical care can apply for benefits under Medicare or Medicaid. Some cognitive behavior therapists offer a sliding scale of fees, which are fees based upon one’s ability to pay for services. Inform the person you’re counseling to explain his or her financial situation to the therapist and, if necessary, to try to work out a payment plan that extends over a period of time. Of course, if a parent will be paying for a child’s therapy, the parent should have this conversation with the therapist. Because the only effective, scientifically-supported therapy for OCD is CBT, sometimes in combination with prescription medication, it’s important that you tell people who seek your help not to waste time or money on unproven, ineffective therapies. At this time, there is insufficient evidence to support the use of treatments such as hypnosis, herbal or homeopathic remedies, relaxation therapy, eye movement desensitization reprocessing (EMDR) or dietary changes. And psychoanalysis and therapies that focus on family dynamics, early childhood trauma or issues of self-esteem are not effective treatments for OCD. While certain forms of therapy, such as marriage and family counseling, can help with relationship problems and other difficulties that frequently accompany OCD, CBT and medication represent the cornerstone of treatment for OCD. Of note is that any potential therapist should be trained and experienced in Cognitive Behavior Therapy. It’s important to emphasize to those you counsel that they should (a) keep looking for a therapist if the one they’ve contacted has never conducted CBT with patients, and (b) ask the therapist certain questions about OCD treatment to save time and possibly money. Learn more questions to ask a prospective therapist. An appropriate amount of “due diligence” in selecting a therapist will ultimately result in finding a qualified and experienced CBT therapist. Local mental health associations may be important resources with regard to names of cognitive behavior therapists and information regarding any kind of financial assistance that may be available for treatment. 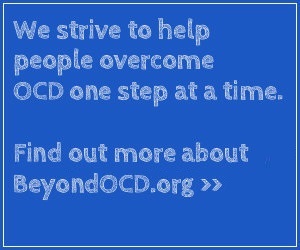 It’s also important to know that meditation, yoga and exercise can complement formal treatment for OCD. Many people find these tools to be extremely effective in helping reduce anxiety and facilitating the treatment process. Asking the prescribing doctor whether a generic form of the medication prescribed is available. Generic drugs generally are less expensive than “name brand” medications. For example, Prozac, a brand name medication, is far more expensive than fluoxetine, the generic form of the drug. Calling various pharmacies to find the one that offers the medication at the lowest cost. Asking pharmacies if ordering a three-month supply would lower the cost. Some insurance companies offer discounts on co-pays for prescriptions if the medications are ordered in 90-day supplies by mail or online. Although reducing the cost of medication may be important to the individual you’re counseling, it’s important to inform them that they should avoid ordering medications online from unknown sources. Some web sites offer easy access to “doctors” who will write prescriptions that are filled by online “pharmacies.” In some cases, junk email messages offer discounts on prescription medications, which are often filled in foreign countries. The prices of drugs sold by some unknown sources may be attractive and far lower than those offered by local and reputable online pharmacies. But there are many confirmed reports of online shoppers receiving fake medications. In fact, when analyzed, some of these drugs were actually found to contain harmful substances including contaminated powders and, in one case, cement! Obviously, you would never want anyone to risk taking counterfeit medications.